Congratulations to Pam who said "I have been entering a lot of giveaways lately - a great way to find new blogs." Thank you to everyone who entered! I love to read all your wonderful comments. Happy February! This month we're giving away a Fun Flowers Totes on Bolts Kit by Lakehouse Dry Goods. The winner will get to choose if they want a black or white tote kit. All the bright and happy flowers are a great reminder that spring is coming very soon! -And I know not everyone has their own Blog or Twitter or Facebook account.....So, you can receive an extra entry if you let me know that you e-mailed at least 3 friends and told them about this. Soooo.....you can "earn" up to FIVE chances to win this kit! IMPORTANT NOTE: Please be sure to leave a blog comment for every additional entry you do. For example....Leave your first blog comment about whatever crosses your mind for your first entry. But be sure to leave another comment saying "I tweeted this" or "I Facebooked this" etc. so I know that you get extra chances to win. And you may notice the handy dandy little grey buttons at the bottom of each blog post for Twitter, Facebook, etc. It's just a simple way to spread the word! The Giveaway ends on February 28, 2011. The winner will be chosen on March 1, 2011. Oh pretty! Love the flowers, so cheerful! Thanks for the chance! These are so cute! I would love to win! Following you on Twitter. I'm embmimi. These bags are sooo cool! I'd love to win a kit. Thanks for the cahnce!! I am a follower. Would love to win this sweet kit! I am going to let my quilting friends know about your giveaway - I'll bet that a couple will respond for sure!! I am so excited!! Thanks!! Very cute design and beautiful fabric kit too! we must be thinking 'new season, new bag' as i've been reading and getting confused over bag patterns all morning! thanks for the chance! Today would be perfect to make a tote - snowed in! Thanks for a chance. They are so cute - love them both! Sweet giveaway!!!! Thanks sew much for the chance to win! I spread the good word on FB!!! Gonna email a bunchload of friends now...!!! love the bag! it's really cute! thanks for the chance. Very cute. Thanks for the opportunity to win. These are so cute. I would love to win a black one. My girls tease me about my attraction to black purses and bags. Great giveaway! Love the wonderful reminder that spring will be coming. Hoping to thaw out soon! These bags are really cute! What a great bag pattern - and thanks for the giveaway! Love the bag - thanks for the chance to win. I sent your site to three friends by e-mail - thanks! Don't follow on twitter or facebook, but thanks for the chance to win - and I am a follower of your blog. Love the bag & the fabric is so pretty. Thanks for the chance to win. I like to make purses for my daughter...she really appreciates them as an accessory. I've made her three and would love to make her the white one for summer! would love a chance - so very pretty. I DO love the pinks! Anything pink has my vote always! I tweeted, posted to my blog - quiltingacrosstexas.blogspot.com , and posted to my fb page - Hen House Quilters. Love, love, love Lakehouse Fabrics! Can't wait to see who wins! Thank you for the giveaway! Just posted to my blog! on making totes and bags!! I am excited to follow your blog! I really would love a chance to win! I am all iced in and need a new fun project! Very nice! I love totes. My first visit to your blog and to your shop. I popped over from A Quilting Life. Thanks for the chance to win. I love your February giveaway totes. It would be 'sew' much fun to win since my birthday is also in February. 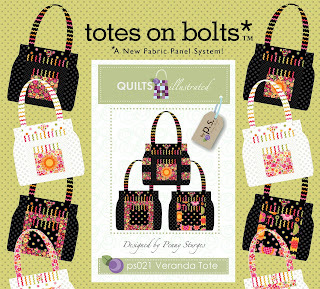 Love your blog and those totes on bolts looking very interesting!!!! I have been entering a lot of giveaways lately-a great way to find new blogs. That's a cute purse, I'd probably go with the black one. Nice giveaway! Thanks for a chance! And I facebooked it too! This is a great idea--pre-printed purses to make! Thanks for the opportunity! What cute bags I would love to make one. The bag looks great. I would love to win. I have wanted to make a bag but have never tried. Would be nice to win this one. Thanks. Sooo cute.....this would be perfect for my daughter. So pretty! I really like the black one! lovely bags!! I love a variety of bags to use in the summer. so cute and I know my youngest would love it!! How lovely - I would love to make it in black. Thanks for the lovely giveaway. I emailed my daughter, my sewing buddy and three other friends! Thank you sew much for the chance to win! Love this Lakehouse giveaway! Thanks both to you, Jenny, and to Lakehouse for the chance! I love both of them, but I would pick the black one! I love them both. Decisions, decisions. Love the bags!! I am a bit of a tote freak...sad huh?!! I would love to win this kit. It's darling. The black purse really pops! Thanks for the chance to win one. My Facebook page now has information about your blog and this contest! Hope youu get a lot of traffic from it. I'm off to email some friends. I emailed 4 friends who said that it was ok to email them the info and link. I hope my name is the one drawn, I love that purse. Very cute! I love Lakehouse! I'd love to win this kit. Such a cute tote! I'd love the black kit! Thanks for the chance! !st time on your blog. Love Emma! These bags look perfect for summer! Would love to win this one!! Thanks for the chance!! Posting on the sidebar of my blog...just give me a chance to hit the 'Update" blog button! Thanks!! I love this kit! What a generous giveaway - thanks for doing that! I don't twitter or facebook, but I have sent an e-mail about your blog and the giveaway to several of my friends! I saw your link while searching for the Fab Shop bunny. I love the black tote - it is really striking! Thanks for sponsoring this giveaway. I love Lakehouse fabrics. They are so bold and colorful. Sign me up for your giveaway! Would love to win the kit, black would be my choice. Thanks! Love Lakehouse fabrics--always nice! These are cute! So very cute. Would love to make one of these or 2 or three. Spring is in the air! I think I'd be brave and go for the white tote, it goes with everything -- all my jeans and t-shirts, which is my summer wardrobe. I'd love to win! Oh wow these totes looks so great! Thanks for the great giveaway! OOh those are cute! Would love to win! Thanks for a great giveaway! I could really put these bags to good use especially when I pick up my grandkids at daycare. I am a follower! thanks for the lovely giveaway! THANKS FOR YOUR BLOG TOO! What a wonderful pattern. Thanks for the opportunity. Love this tote, thanks for the giveaway! I put this giveaway on my blog! I am now a follower of your blog, thanks! What pretty bags! I'd love to win this, thanks for the opportunity. thanks for the chance to win - very pretty bags! Totally love these but the white with the flowers is so springy and we could all sure enjoy one of these after the winter we've all had! I just added this to my FB profile. Very nice! I'm keeping my fingers crossed! From sunny Austin on a lovely Saturday with a quilt show to go to. So sweet-would love to win the black one! Thanks for the giveaway! What a cute tote. Thanks for the chance to win one. I was just thinking I needed a new bag. Thanks for sharing. What a great giveaway! Black for me, please. Cute! Thanks for the chance. Thanks, both of those are very cute. I love kits! I love making bags. Thanks for the giveaway. I have seen this before and it looks really intersting to make. Love to sew!!!! Thanks for the giveaway!!! Hi, I'm Jenny! I'm currently working on designing planner stickers, fabric and jewelry after running an online quilt shop for 4 years and being a veterinarian for 10 years. I love planners, stickers, dollhouse miniatures, sewing, quilting, cross stitch, cats, dogs, running, red wine and my Cavalier King Charles Spaniels, Baxter and Betsy.